Fig. 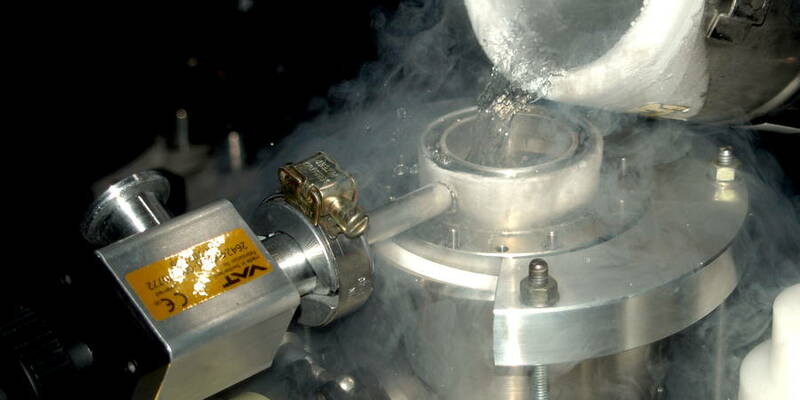 2: The cryostat is cooled with liquid nitrogen. This topic focuses on the observation of individual fluorescence-labelled biomolecules that are frozen in a very thin layer of their solution. 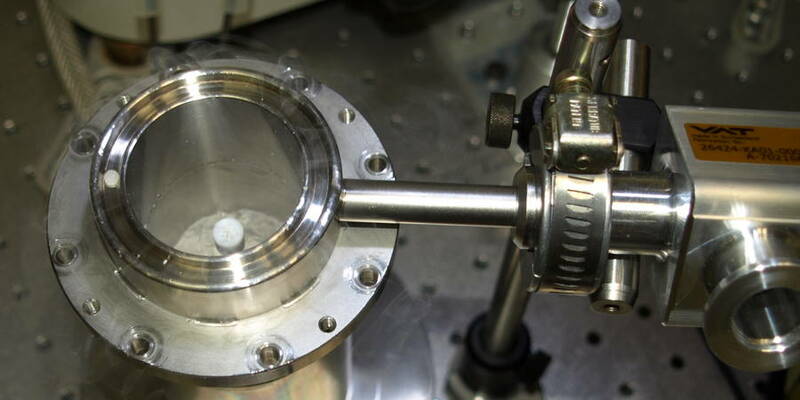 This type of immobilization enables to increase the observation time of the molecule from a few hundred microseconds in solution experiments to several seconds. Thus, it is only limited by the survival time of the dye molecule, which is theoretically longer than in solution due to reduced photobleaching processes. The aim of the freezing process is to maintain the "structure at room temperature" of the biomolecule. This is only possible if the water vitrifies during freezing, i.e. changes into a solid amorphous state and does not form any crystal structures. A high cooling rate, low sample volume and high viscosity are decisive for vitrification. A cold spincoating process was developed for the preparation of the thin ice layer (see Fig. 1). A rotating cover glass (approx. 9000 rpm) is cooled by liquid nitrogen. The sample, fluorescence-labelled biomolecules in an aqueous solution, is dripped onto the cover glass and freezes on it. The cover glass is then transferred to the Dewar vessel in which it was cooled into a cryocup mounted on a microscope stand and is further cooled with liquid nitrogen (see Fig. 2). Using a confocal laser scanning microscope, the frozen dyes are now examined with regard to their fluorescence properties, e.g. intensity, lifetime, spectrum, energy transfer. For example, if a biomolecule is labelled with two dyes, the efficiency of the Förster energy transfer (FRET), which is a measure of the distance between two dyes, can provide information about the conformation of individual molecules (see Fig. 3).